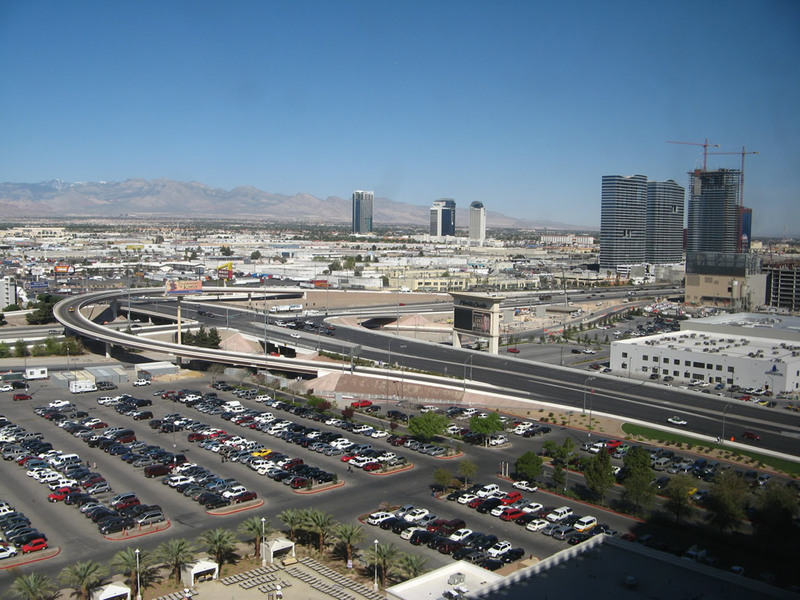 Looking west, this view from the Excalibur Hotel shows the interchange between Nevada 593/Tropicana Avenue and Interstate 15. 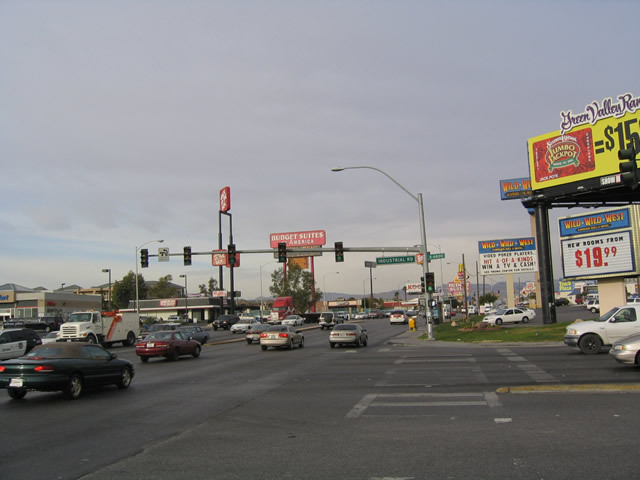 The intersection with Dean Martin Drive (former Industrial Road) is on the west side of the freeway; this is the western terminus of Nevada 593. Photo taken 03/29/08. 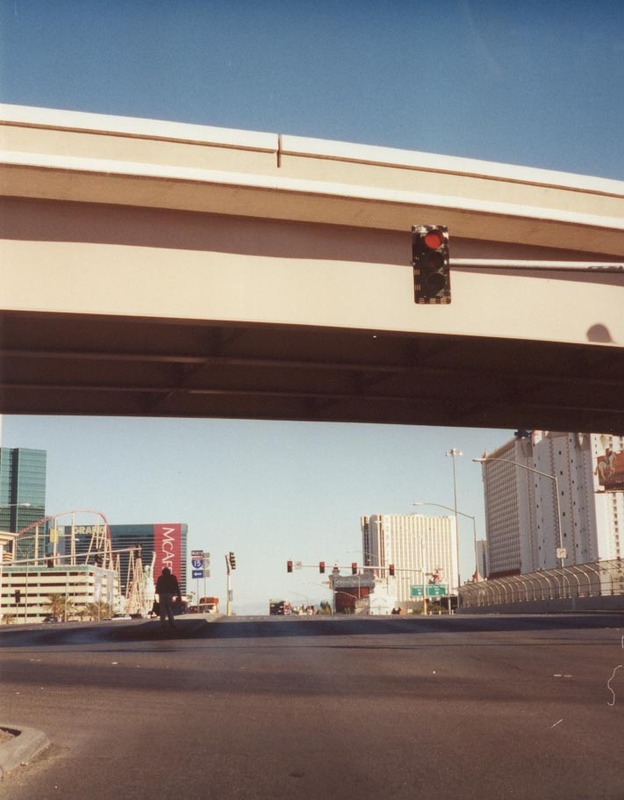 Nevada 593 is Tropicana Avenue, a major east-west arterial that crosses Las Vegas Boulevard at the intersection that houses four major casinos: MGM Grand, New York New York, Excalibur, and Tropicana. 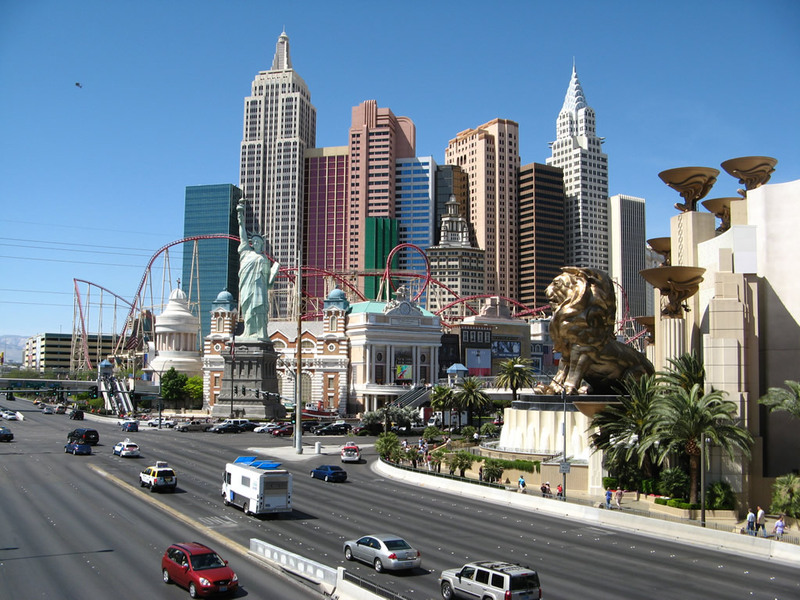 It is also a principal route from the Strip to McCarran International Airport. 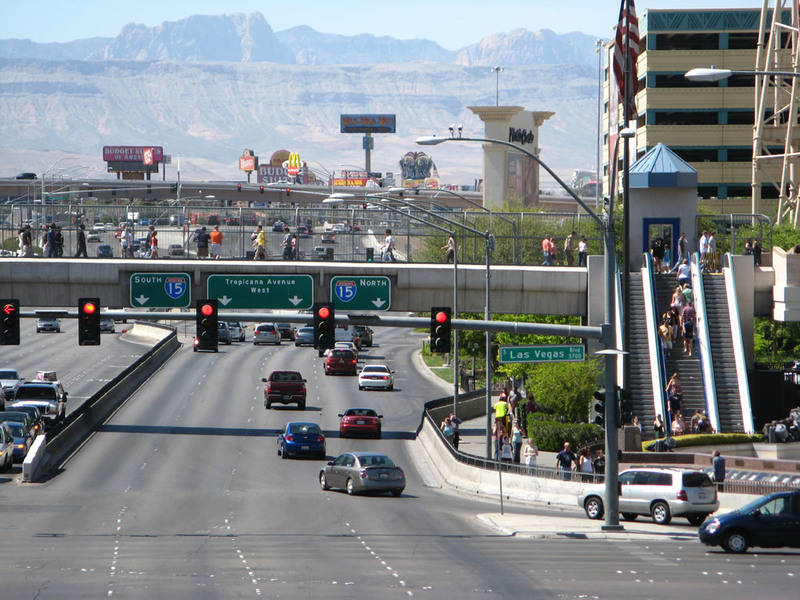 With high traffic volumes and direct access to the airport, Nevada 593 has as many as ten lanes, even though it is a local access street with no freeway sections. 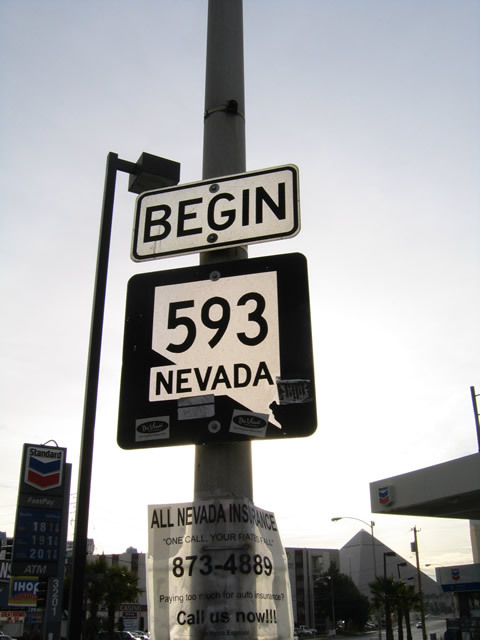 The state route begins at Dean Martin Drive (former Industrial Road) and travels east through the unincorporated community of Paradise to Nevada 582/Boulder Highway after the interchange with Interstate 515 and U.S. 93-95. 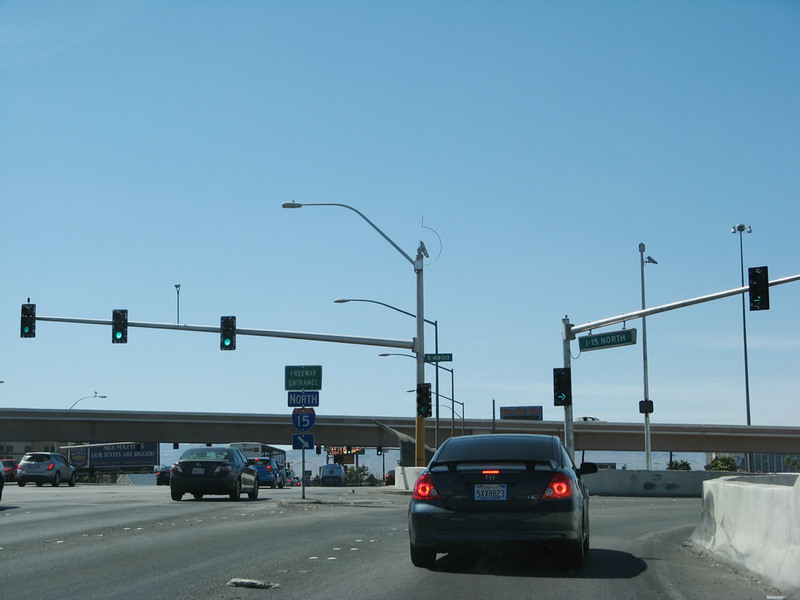 These two pictures shows the eastbound beginning of Nevada 593 as seen along eastbound Tropicana Avenue at Dean Martin Drive (Industrial Road) prior to the interchange with Interstate 15. Nevada is generally pretty good about signing the beginning and ending of state maintained routes with shields such as these within the Las Vegas Valley. 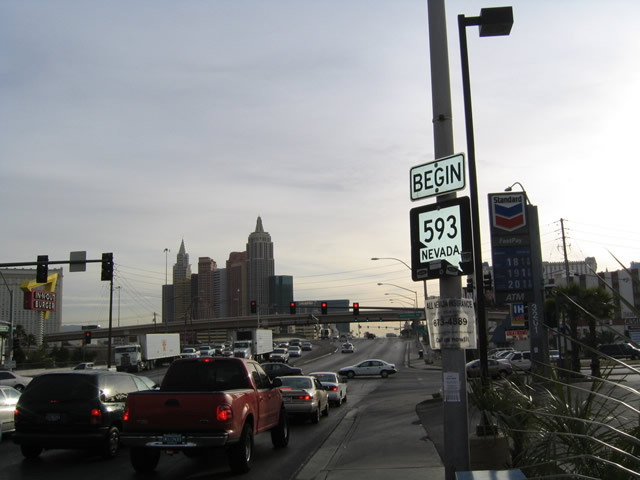 With the recent decommissioning of several Nevada state routes in the Las Vegas metropolitan area, Nevada 593 now begins at Dean Martin Drive (former Industrial Road), which acts as a frontage road on the west side of Interstate 15. 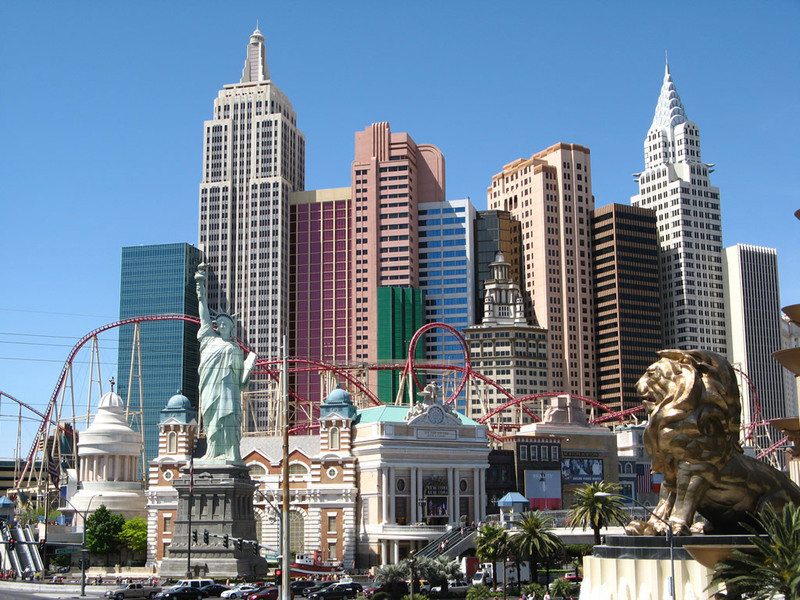 The skyline of the New York New York resort and the Las Vegas Strip dominate the view looking east. Nevada 593 follows Tropicana Avenue east from here, over Interstate 15, past Las Vegas Boulevard and the Strip, and then onward toward McCarran International Airport. Photos taken 02/16/04. After the Dean Martin Drive intersection, eastbound Nevada 593/Tropicana Avenue approaches its junction with Interstate 15. The right lane exits onto Interstate 15 south to Jean, Primm, and Southern California (with a control city of Los Angeles). 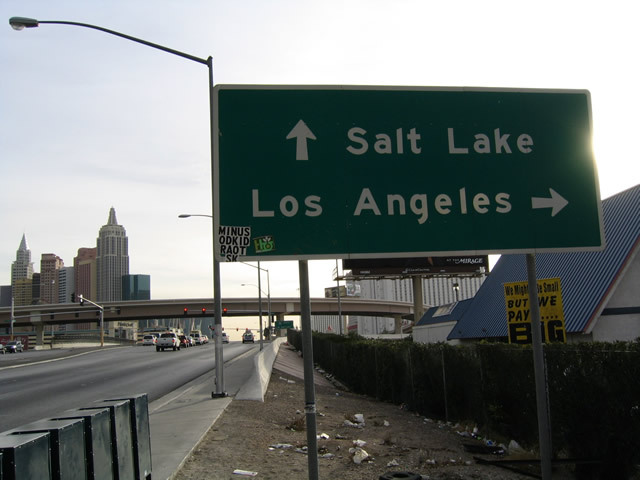 A left turn ahead connects to Interstate 15 north to downtown Las Vegas, Mesquite, and Salt Lake City, Utah. Photo taken 02/16/04. These Interstate 15 Nevada trailblazer shields are posted along eastbound Nevada 593/Tropicana Avenue prior to the onramp to southbound Interstate 15 to Los Angeles. Photo taken 02/15/04. Eastbound Nevada 593/Tropicana Avenue meets Interstate 15. 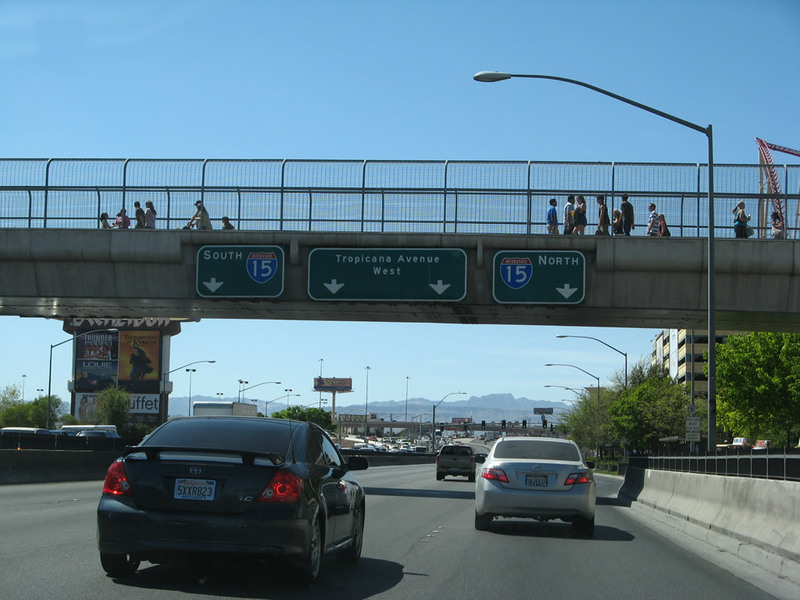 The left turn at the end of the overpass connects Nevada 593 east with Interstate 15 north to downtown Las Vegas and Salt Lake City. 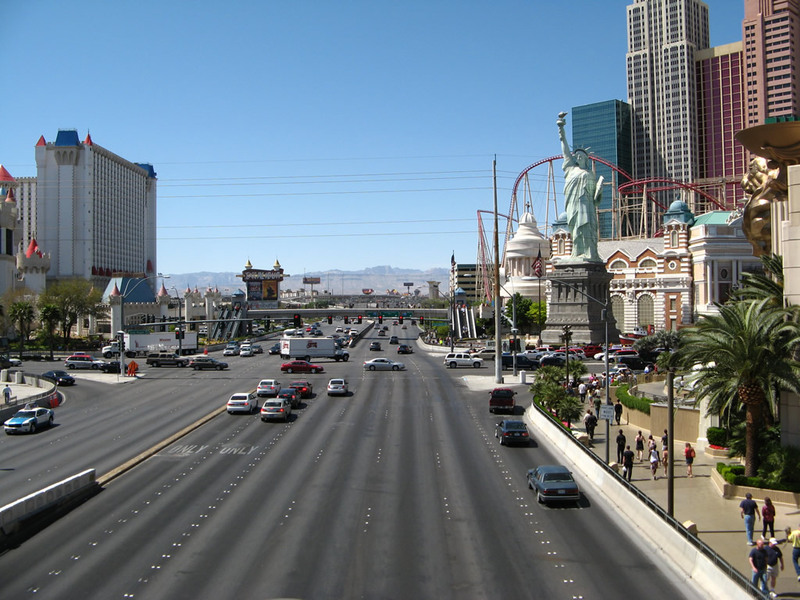 The Las Vegas Strip (former Nevada 604/Las Vegas Boulevard) is visible in the distance from this bridge over Interstate 15, as well as a view of the New York, New York hotel-casino on the left (north) and Excalibur on the right (south). Tropicana is a major east-west route here, with up to 12 lanes including turn and auxiliary lanes. Nevada 593/Tropicana Avenue also connects the Strip with McCarran International Airport. Photos taken 11/12/00. After the Interstate 15 interchange, this eastbound reassurance shield is posted next to the Excalibur resort prior to intersecting Las Vegas Boulevard (Former Nevada 604/U.S. 91-466). The MGM Grand resort and New York New York resort are visible in the background of this nighttime picture. Photo taken 02/15/04. Looking east from the pedestrian bridge between Excalibur resort and New York New York resort, this view shows eastbound Nevada 593/Tropicana Avenue at the intersection with Las Vegas Boulevard (former Nevada 604). Photo taken 03/29/08. After Las Vegas Boulevard, this view shows eastbound Nevada 593/Tropicana Avenue as the multi-lane road travels through the unincorporated community of Paradise. 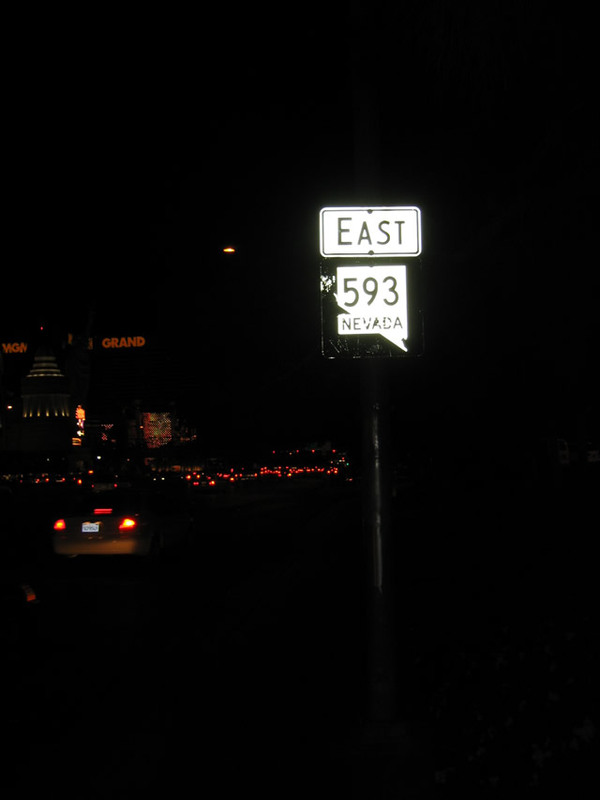 Nevada 593 will pass along the northern edge of McCarran International Airport and the southern edge of the University of Nevada at Las Vegas (UNLV) between the Las Vegas Strip and Maryland Parkway. Photo taken 03/29/08. 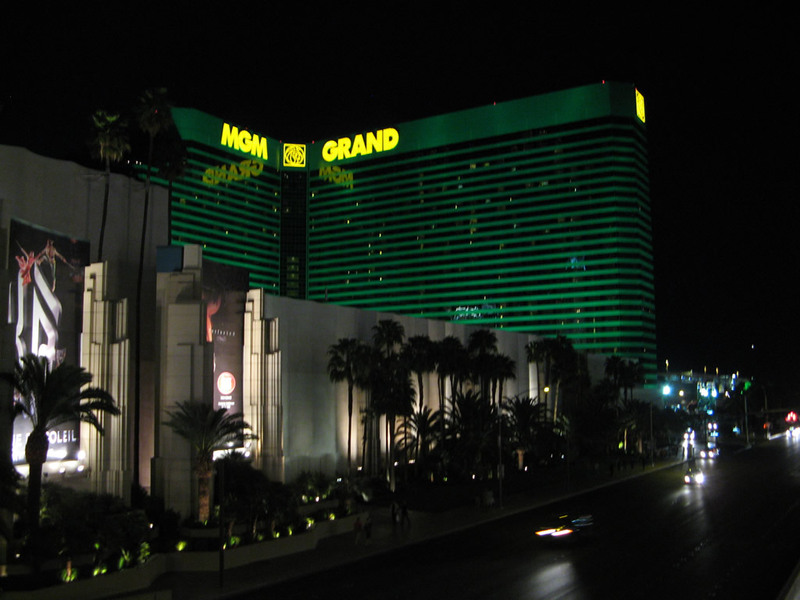 The green-hued MGM Grand resort and hotel comes into view on the north side of Tropicana Avenue. Photos taken 03/28/08. 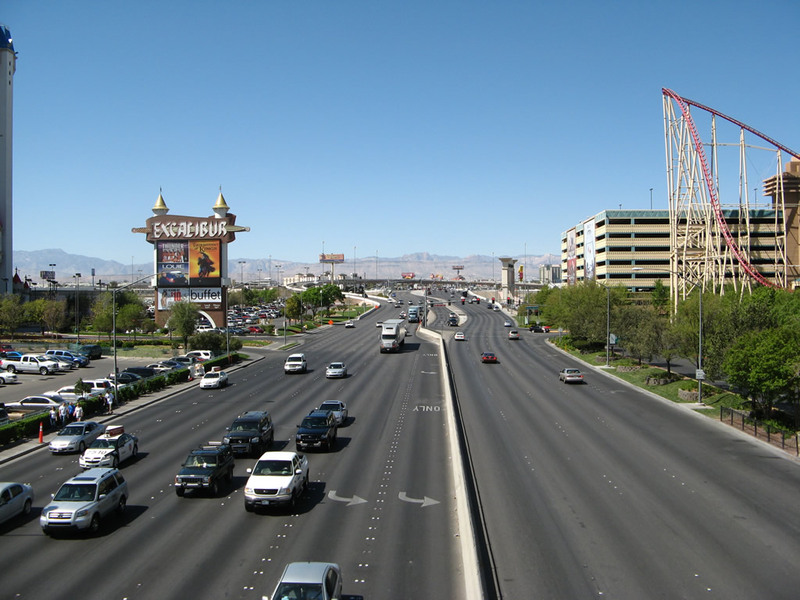 Seven lanes of westbound Nevada 593/Tropicana Avenue approach the intersection with Las Vegas Boulevard. 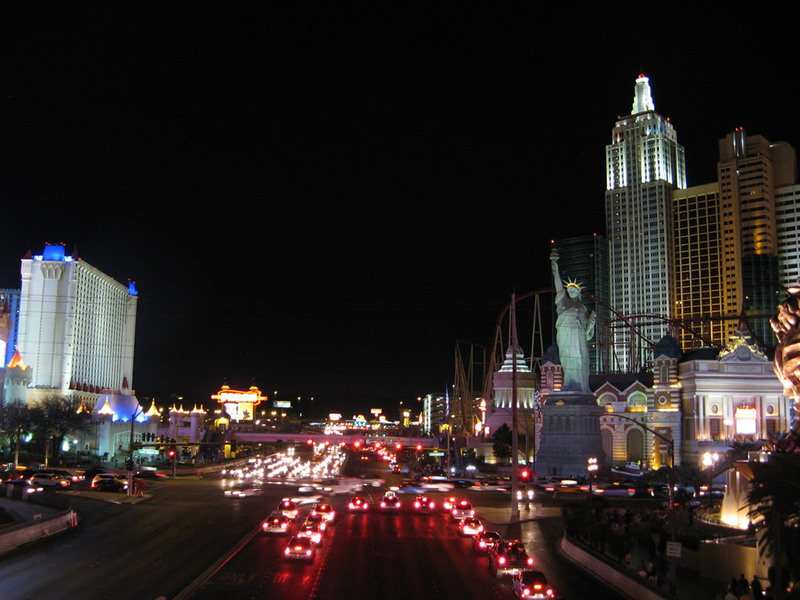 The New York New York resort dominates the view on the northwest corner of this major intersection. 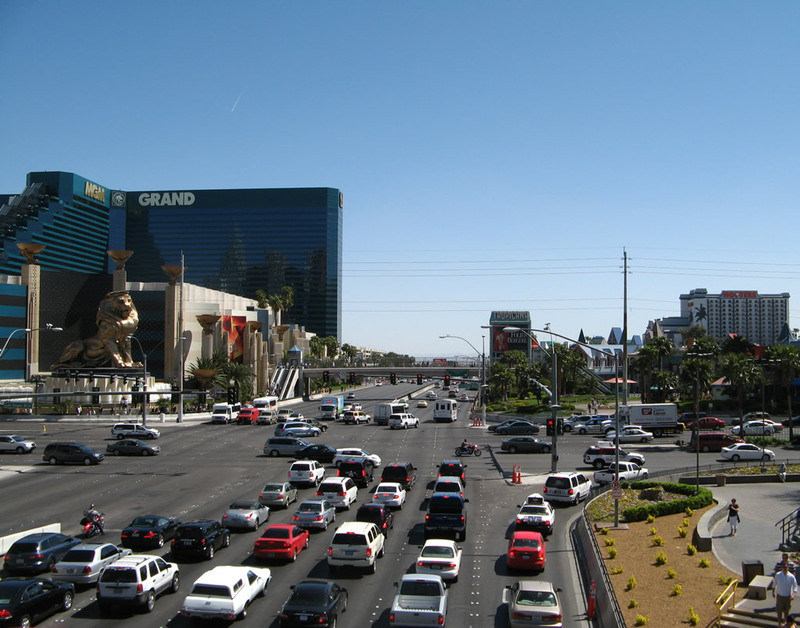 Turn left on Las Vegas Boulevard to the Excalibur, Luxor, and Mandalay Resorts. 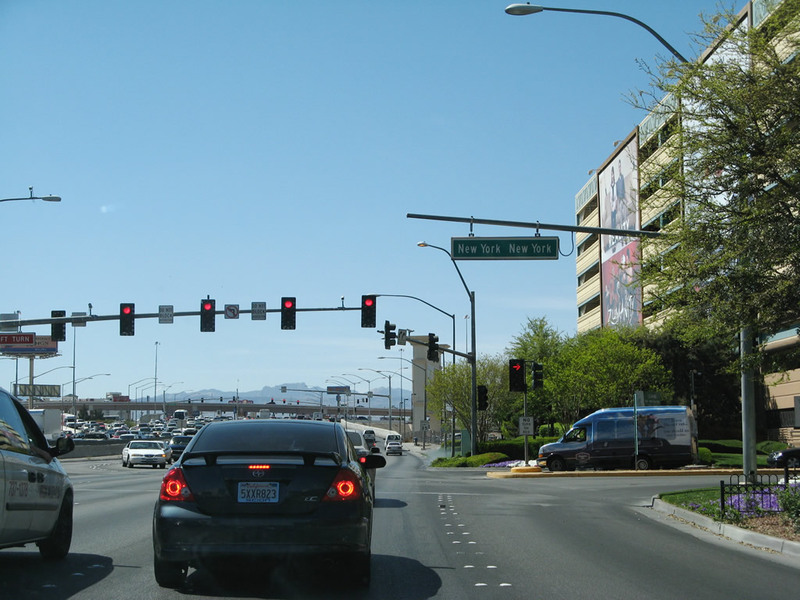 For most other resorts on the Strip, turn right (north) on Las Vegas Boulevard. This view is from the pedestrian bridge between MGM Grand resort and the Tropicana resort. Photos taken 03/29/08 and 03/28/08. A slightly angled view from the pedestrian bridge offers a full view of the New York New York resort skyline. Photos taken 03/29/08. 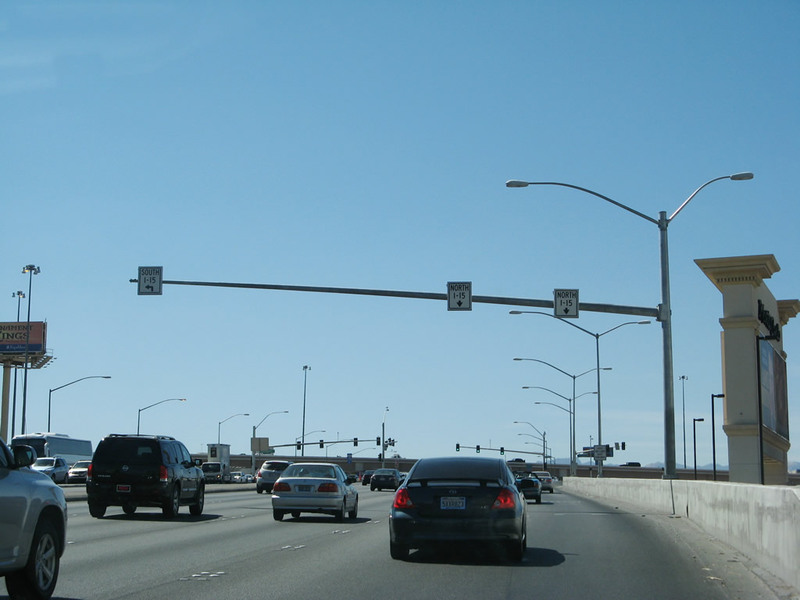 Returning to the traffic signal between westbound Tropicana Avenue and Las Vegas Boulevard, green guide signs provide the lane allocations for the connection to Interstate 15 north and south. 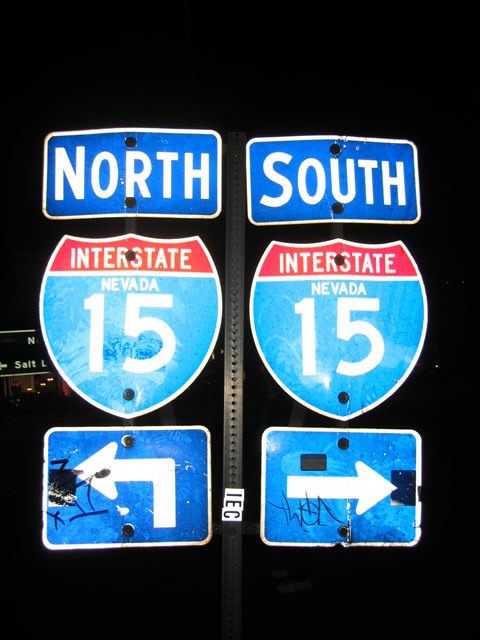 Stay left for Interstate 15 south to Primm and all points in Southern California; stay right for Interstate 15 north to downtown Las Vegas and points north. Photos taken 03/29/08. 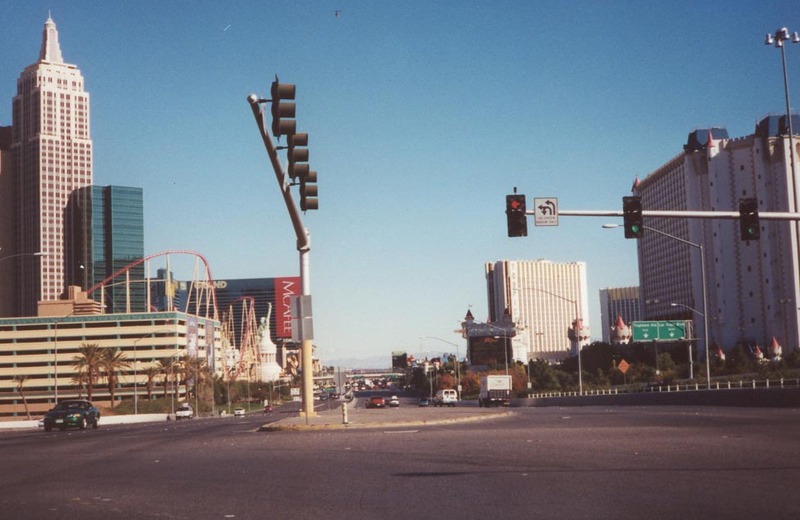 A ground-level view shows the intersection between Tropicana Avenue and the New York New York Driveway. Photo taken 03/29/08. 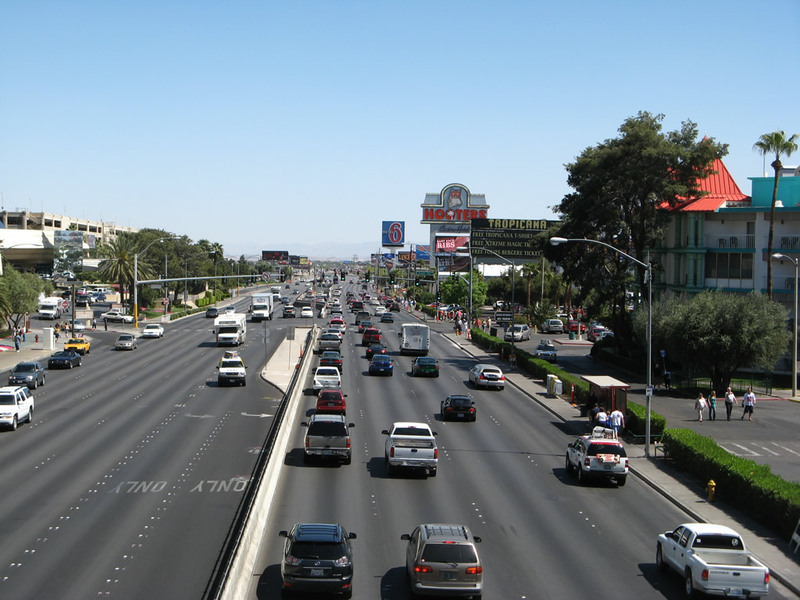 Twelve lanes of Tropicana Avenue provide for traffic between Las Vegas Boulevard and Interstate 15. This view is from the pedestrian bridge between Excalibur resort and the New York New York resort. Seven lanes travel east at this point, and five lanes travel west. Note the use of botts dots pavement lane markings. Photo taken 03/29/08. 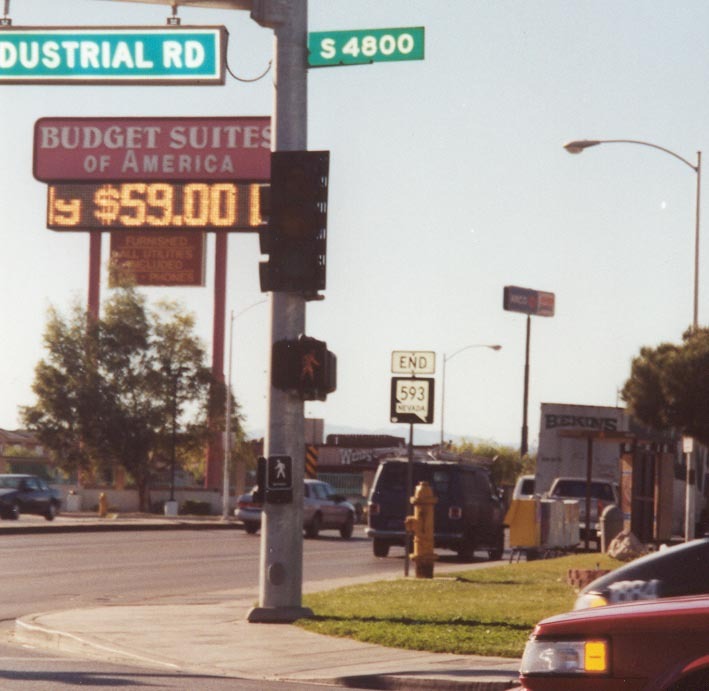 Another ground-level view shows the tiny white signs that show the lane allocation from Nevada 593/Tropicana Avenue to Interstate 15 north and south. Photo taken 03/29/08. The first right from westbound Nevada 593/Tropicana Avenue connects to Interstate 15 north to downtown Las Vegas. A freeway entrance shield assembly is posted on the traffic island between the travel lanes. Photo taken 03/29/08. 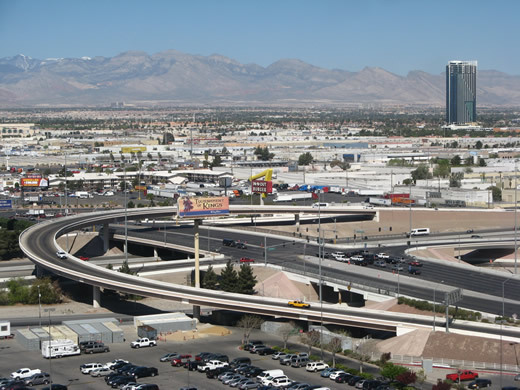 This view of the interchange between Nevada 593/Tropicana Avenue and Interstate 15 is from the Excalibur Resort and Hotel. Photo taken 03/29/08. 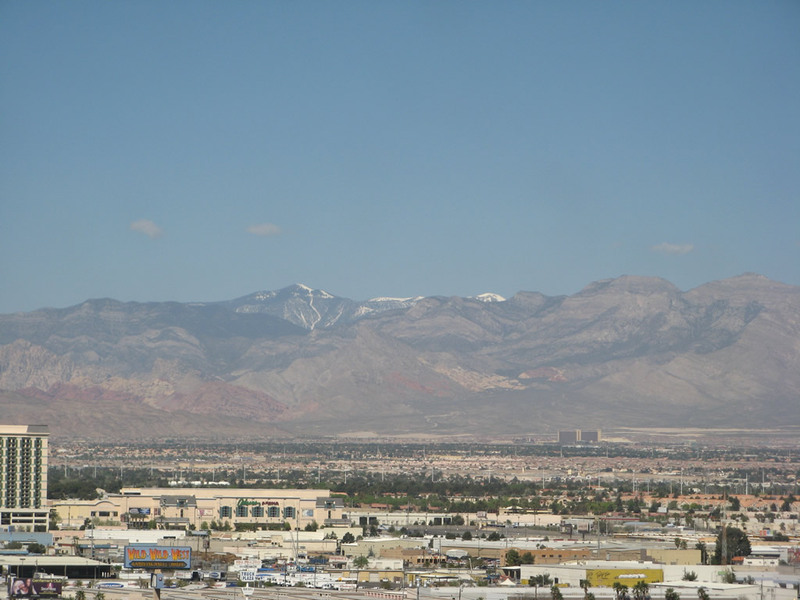 The Spring Moutains west of Las Vegas are visible on most days from westbound Tropicana Avenue. Red Rock Canyon National Conversation Area can be seen in the foothills of these mountains. This view is also afforded from the Excalibur resort. Photo taken 03/29/08. Westbound Nevada 593 comes to its end here, at the intersection with Dean Martin Drive (former Industrial Road) just west of Interstate 15 and west of the Las Vegas Strip. Tropicana Avenue continues west toward the unincorporated community of Spring Valley before connecting with the 215/Bruce Woodbury Las Vegas Beltway. Photo taken 02/16/04. 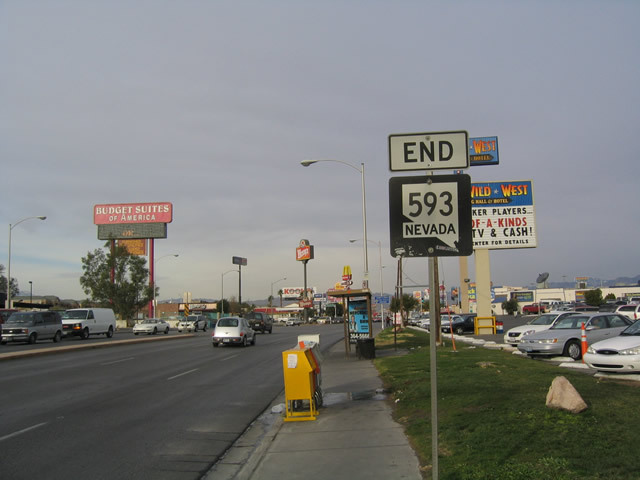 An end Nevada 593 shield is posted along westbound Tropicana Avenue at the intersection with Dean Martin Drive (former Industrial Road) just west of Interstate 15. While Tropicana Avenue continues west of here, state maintenance of the road ends here (and hence Nevada 593 ends here as well). 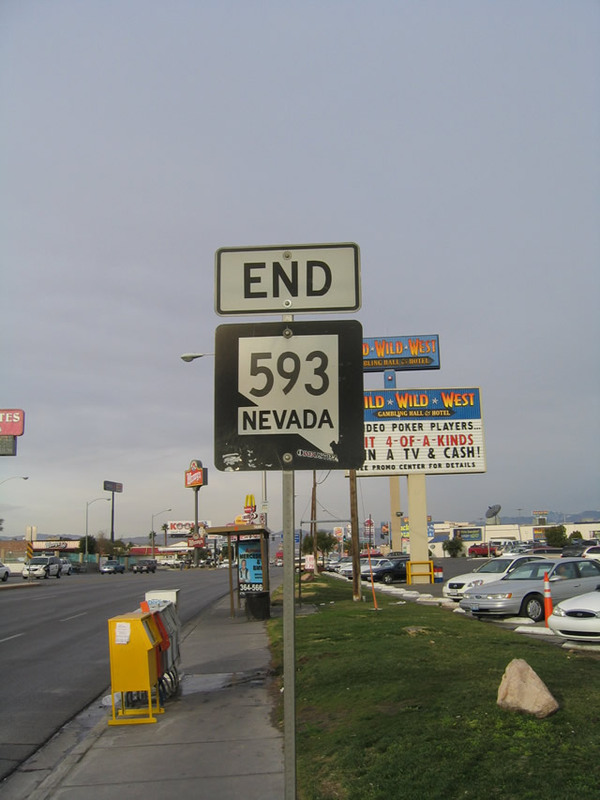 The Nevada Department of Transportation usually tried to do a good job of signing the beginning and endings of their state routes in the Las Vegas metropolitan area, but they generally are not as good about placing many reassurance signs in between the end points. Photos taken 02/16/04 and 11/12/00. 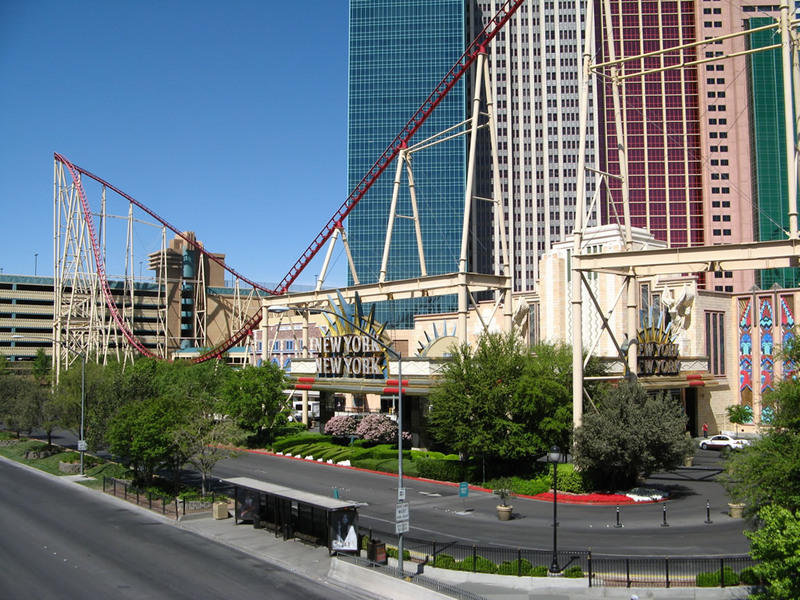 This view shows the south entrance to the New York New York resort along the north side of Tropicana Avenue between Las Vegas Boulevard and Interstate 15. This view is from the pedestrian bridge between Excalibur and New York New York. Photo taken 03/29/08. 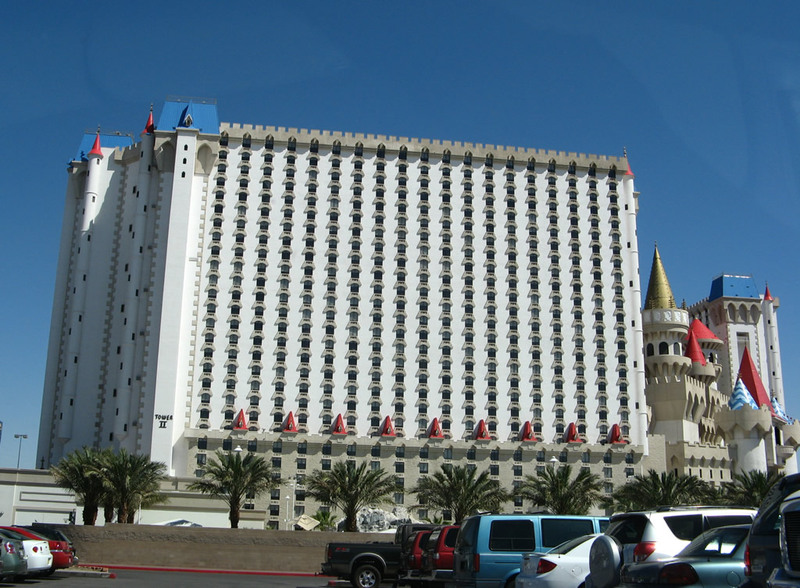 The Excalibur resort, with its tall hotel tower, dominates the view on the south side of Tropicana Avenue between Interstate 15 and Las Vegas Boulevard. Photo taken 03/29/08. Page Updated May 4, 2008.